If you have time for a one day trip from Florence, consider crossing the border between Tuscany and Umbria. Considered by many to be the green heart of Italy, Umbria has no sea coast but is dominated by fertile fields and rolling hills hiding old stone villages. It is also sacred ground; the Umbrian town of Assisi is the birthplace of Saint Francis and Saint Clare. Tuscany guided tours that cross into Umbria will almost certainly include visits to Assisi and the more secularly significant city of Perugia. The two towns are so different that it is worth visiting both to fully experience Umbria. The medieval town of Assisi has spiritual significance to many but it will leave an impression regardless of one’s religious beliefs. In Assisi’s main square, the Piazza del Comune, Roman ruins in the form of an old temple (later transformed into the church of Santa Maria Sopra Minerva) testify to Assisi’s ancient foundations. As with many other Umbrian towns, quaint and quiet streets offer respite from modern urban life. Shops sell goblets made of Italian olive wood and bottles of special Sagrantino wine from nearby Montefalco. 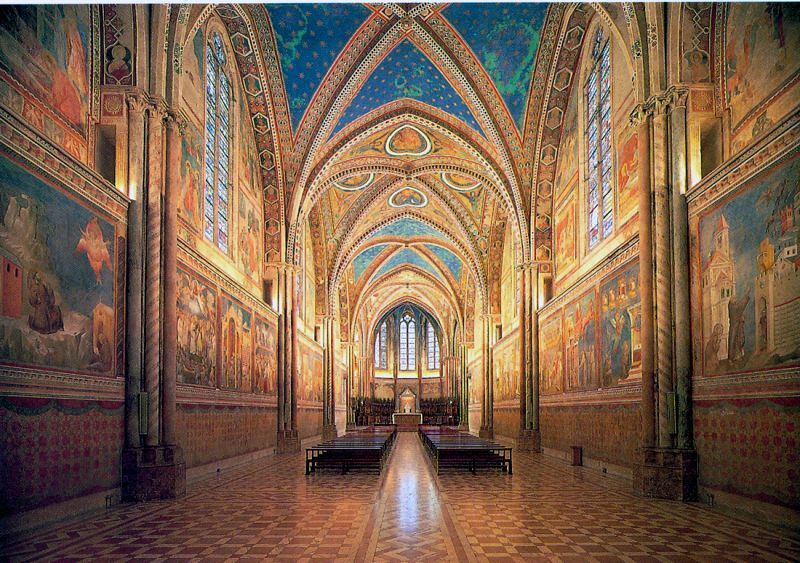 Certainly, themain attraction in Assisi is the Basilica of St. Francis. Frescoes by Giotto color the interior walls and ceilings, and stairs worn smooth by pilgrim feet lead down to the tomb of the saint. When illuminated at night, the white-walled structure is a breathtaking site, whether viewed up close or from the valley below. The basilica which houses the remains of Saint Clare (Santa Chiara) features a stunning rose window. Another abbey worth visiting is that of San Benedetto. First references to the Abbazia di San Benedetto date back to 1030 -- nearly a thousand years ago! The history of Perugia dates back thousands of years to the Etruscans, with many visible remains of that era. The city gate Porta Marzia, near the Rocca Paolina fortress, has survived since the third century BC. The subterranean Pozzo Etrusco (Etruscan well), near the entrance to the San Lorenzo cathedral, is another example. To further explore Perugia’s depths, escalators take you from modern day streets to those of medieval times. The Rocca was constructed atop ancient thoroughfares, and it is possible to walk on them within the walls of the fortress. Nowadays, they lead to art and history exhibits held in underground galleries. Perugia remains a vital academic and government center. Visitors admire the spectacular views from the city’s stately parks and steep promenades, and centuries-old paintings in the Umbrian National Gallery. Chocolate afficionados love Perugia, too. Home to Italian chocolatiers Perugina and Baci, Perugia holds a chocolate festival every October. The city also hosts two lively music festivals: Umbria Jazz in July, and Music Fest Perugia in August, when the focus turns to classical music.